BETHLEHEM : Thousands of Palestinians and tourists were flocking to the West Bank city of Bethlehem on Monday to mark Christmas at the site where many believe Jesus Christ was born. This year's celebration carries special significance for many Palestinians, coming after 12 months in which their status on the world stage has been significantly upgraded. Just last month the United Nations granted them the status of non-member observer state, and earlier this year they won their first UNESCO World Heritage Site designation -- for Bethlehem's Church of the Nativity. The designation also included part of a pilgrimage route in Bethlehem, along which the traditional Christmas procession headed by the Latin Patriarch Fuad Twal will march later Monday. Thousands of tourists are expected to join Palestinian residents of the city -- Muslim and Christian alike -- in lining the route to welcome the procession, which includes dozens of musicians and scout troupes from across the West Bank. 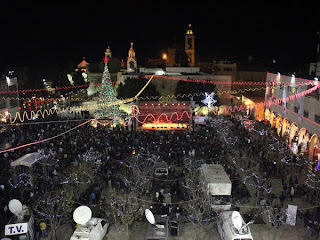 The parade will culminate in Manger Square, in front of the Church of the Nativity, which is built over the site where Christians believe Mary gave birth to Jesus in a cattle shed. Several hours later, Twal, the most senior Roman Catholic bishop in the Middle East, will deliver the traditional midnight mass to the faithful. Scout troupes were already marching in the square to the rhythm of drums and bagpipes mid-morning, while hundreds of tourists looked on. The mass is traditionally attended by top officials from the Palestinian Authority including President Mahmud Abbas and Prime Minister Salam Fayyad. Last week, in his pre-Christmas press conference, Twal praised the UN decision to upgrade Palestinian status, calling it a “step towards peace and stability in the region.” “Israel can now negotiate on equal state-to-state terms for the good of all,” he told reporters, saying the Palestinian issue remained “the cause of all conflicts in the region,” and urging US President Barack Obama to take “immediate action” to push the peace process forward. But Xavier Abu Eid, an advisor to the Palestine Liberation Organisation, said this year's celebration of Christmas would be particularly meaningful for Palestinians nonetheless. “At Christmas, we celebrate the birth of the prince of hope and the prince of peace and the Palestinian people have been hoping for 64 years to achieve a just peace,” he told AFP.